Zippy Shell’s storage solutions are perfect for the transition during the staging and sale of a home. Moving and Storage that’s simple! We bring the storage pods to you. Zippy Shell pods are street legal and fit wherever you need them. We can help with the heavy lifting or arrange for professional loading and packing services. We provide secure and climate controlled storage at our storage centers – protection guaranteed. 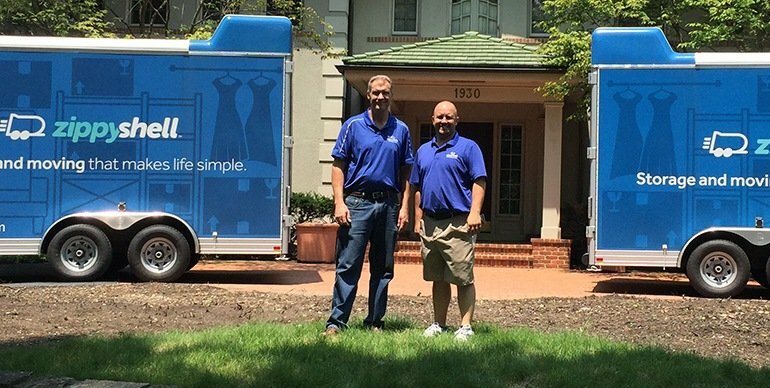 Founded back in 2010, Zippy Shell Incorporated has since become a well-known US brand and franchise network that inspires absolute confidence and customer satisfaction when it comes to moving and storage services and expertise. We like to keep things simple. We deliver a storage container to you and your stuff gets loaded. The moving and storage Columbus, Ohio franchise of Zippy Shell was established in 2015 and follows the same example as the rest of the company. We are straight-forward in the services we provide and we hold nothing back, which is why we are considered the fastest-growing business among moving companies Columbus, Ohio. And trust us when we say – the reputation we enjoy was not built on wooden pallets. No – the foundation of our success lies in the reliable and practical portable storage containers that our movers Columbus Ohio offer to clients, all wrapped together with packing, moving and storage expertise – the full package. With us, the moving needs of the customer always come first. We devote ourselves to the complete safety and protection of your belongings, no matter the distance to your new home or storage unit. So, if you are looking for the best of the best among moving companies Columbus, Ohio, you just found them in the name Zippy Shell Columbus!